There is a WAR raging, varmints. THE STICKER WARS. A lot of people who are fighting the front lines of this battle don't even understand what they're fighting for. Sure, 80's skateboard stickers often lead the charge. Yes, the right old scratch-n-sniff can take down an entire town. Puffy stickers, vintage Mrs. Grossman's, Wacky Packages - these are high quality grenades. Graffiti stickers, specialty boutique vinyls, old BMX foilies for your bike -- of course, they keep us on the move. But the real stickers, the excellent stickers, are the everyday guys that are working the underbelly of the war. The stickers you don't think about. They're like the spies of STICKER WARS. The nurses. The Junior Woodchucks. Today's sticker is the IRREGULAR sticker that you can find on sweatshirts and underwear in your local five and dime. 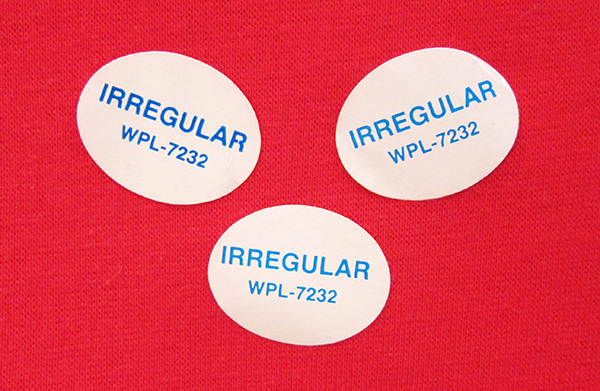 Irregular Stickers are an INTEGRAL part of the war, without them you'd never be able to locate that 3-armed sweatshirt you might need for next year's Arbor Day costume, or for a visiting alien friend. Remember, some people actually have giraffe necks. And just because there's a hole in your shirt, it doesn't mean it's ruined - it's just Irregular. And there's nothing wrong with that. The cruel staff at the hospital of my birth tattooed that on me. I still don't see the humor.